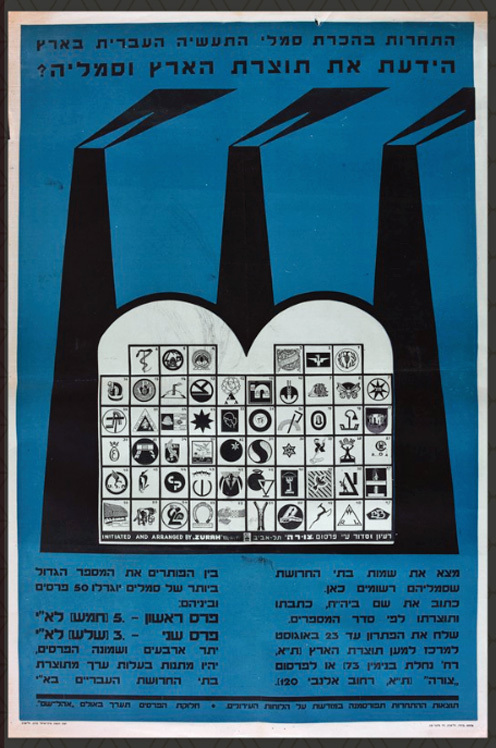 Do You Know the Products of Eretz Israel and Their Symbols? Do you know the products of the country and their symbols? Find the names of the factories whose symbols are listed here. Write the name of the factory, its address, and its product according to the numerical order. Send your solution by August 23 to the Association for Products of Eretz Israel (Tel Aviv, 73 Nahalat Binyamin St.) or to the publication “Tsura” (Tel Aviv, 120 Allenby St.). The rhetoric was unambiguous. Designers used all of the tools at their disposal: biting proclamations with an abundance of exclamation marks, figures of workers drawn in the ideals of the time, and silhouettes of smokestacks and factories, which were popular in socialist iconography all over the world. Form and color, illustrations of fruits and vegetables, flowers and workers and the happy faces of people enjoying Israeli products – all of these are prominent in the posters. However, there are two verbal aspects that stand out: the term "Made in Israel" and the modifier "Hebrew". "Made in Israel" was promoted as a national value in and of itself, and referred to the entire economic production – agricultural, industrial and labor – of the Jewish Yishuv in Eretz Yisrael. The modifier "Hebrew" was attached to everything, a sort of all-encompassing national label: Hebrew eggs, Hebrew bananas, Hebrew butter, Hebrew watermelon and melon, Hebrew cloves, Hebrew roses, Hebrew ships – all of them were part of the Hebrew economic output that needed to be produced and marked with the "Hebrew Tag" – a tag that very quickly became a brand marking products made in Israel.